Nun assassins!?! That idea, right there, was enough to get me excited about this book. And if that wasn't enough, this one promised to deliver strong female characters. Woot! Grave Mercy had more than enough promises to try to keep. Assassins nuns. Strong female character(s). Historical setting with some twists. While starting those first few pages, I will admit that I had quite a few doubts about this one early one. The story starts off in a small town. Our MC, Ismae, has been promised in marriage to a boorish man many years her senior. Like many strong will females, Ismae would rather ran away and face the unknown than be forever tied to her arranged husband. Grave Mercy took its time setting up Ismae's past which I was thankful for. Although, I really wanted to see some killer nuns, I was wanted to have a connection with our MC more. And by LaFevers setting up the tale in this manner, I was better able to handle some of the questionable choices Ismae makes later on in the book. One of Grave Mercy's strongest points is also its weakest, Ismae. Love her backstory. Love her growth and transition. But the action and her kick-assness is strangely lacking. For assassins nuns, they really do not do much assassinating. Instead the plot focuses around more the idea of the build up, the intrigue, getting Ismae into an area and working what her mamma gave her. And while the build up was certainly welcomed, where was my promised action? It just was not there. Or if it was, it was in too small of increments to really count for much in the grand scheme of things. Despite my disappointment in more than one area, I did enjoy Grave Mercy. Killer nuns? Yes, they exist in this book. But more as teachers than killers. Those that do still kill are (more or less) novices, like our MC, learning the ropes. The God of Death? Again, yes. But the mythos surrounding this took a bit of a backseat. I am hoping, with another installment, readers will be able to get more information on this very interesting and original premise. 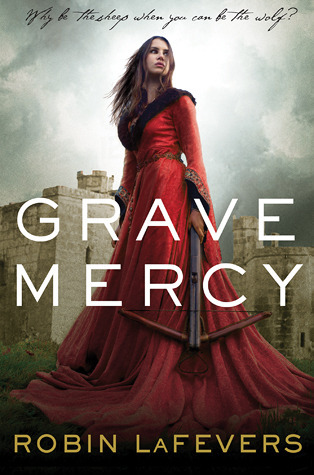 For now, Grave Mercy was an enjoyable read that would have probably been more enoyable if I had ignored that the book's inital hype. I’m glad you enjoyed how Grave Mercy was written, with in-depth look at backgrounds and teaching. It sounds like I would like it as well. The lack of action is disappointing. Thanks for this review! I ended up being let down by the hype too; there was just so much gushing and I don’t really think any book could live up to that. Still I definitely want to read the next book with the adventures of Sybella.